Kids like to collect things. Right now it's Shopkins. Back when I was in grade school Magic cards were all the rage. But not for me. I always collected stickers. I've been a sticker hoarder collector for as long as I can remember. I even collected those sticker seals that you get in the mail during the holidays to use with your Christmas cards. 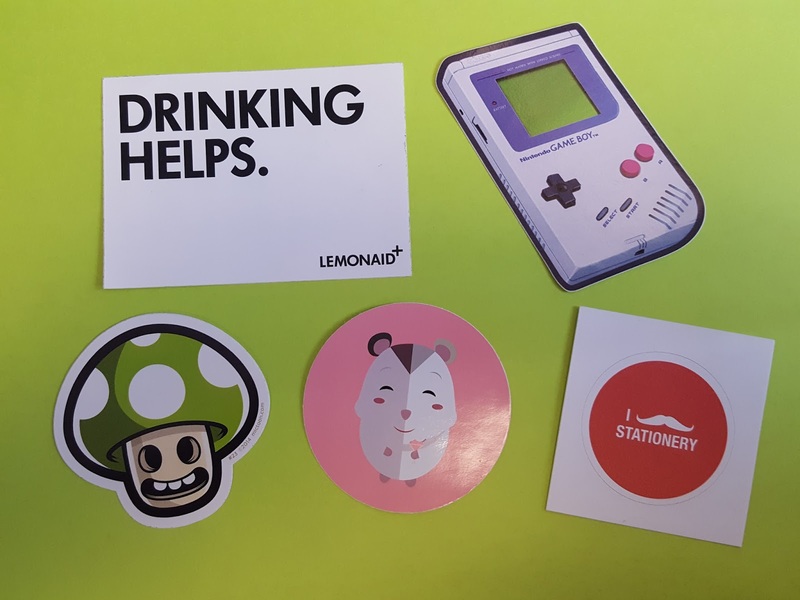 There's something about those adhesive pieces of paper that bring a smile to my face (that might be why I'm also slightly obsessed with post-its). 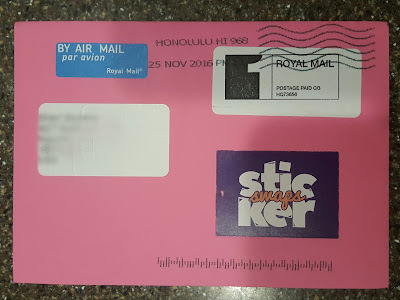 I'm always happy to hear about sticker subscriptions because what's better than getting (non-bill) snail mail? Getting snail mail FULL OF STICKERS. So when Sticker Swaps asked if I'd like to review their sticker pack I said JYEAH!! 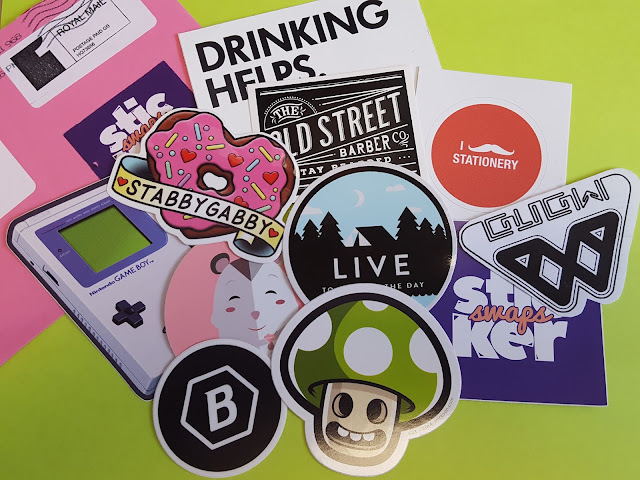 Sticker Swaps is a bit different from most sticker subscriptions in that they don't necessarily get their stickers from huge sticker companies; they try to source them from individual designers. I think this is a great way for up and coming artists to gain exposure and popularity. As a result, the stickers won't fit into a common theme or genre. Instead, you can expect to find a hodgepodge of unique pieces of art and take pride in the fact that not too many people in the world possess that same sticker! Here is what came in November's Sticker Swaps. Just as I expected I haven't come across any of these stickers before. 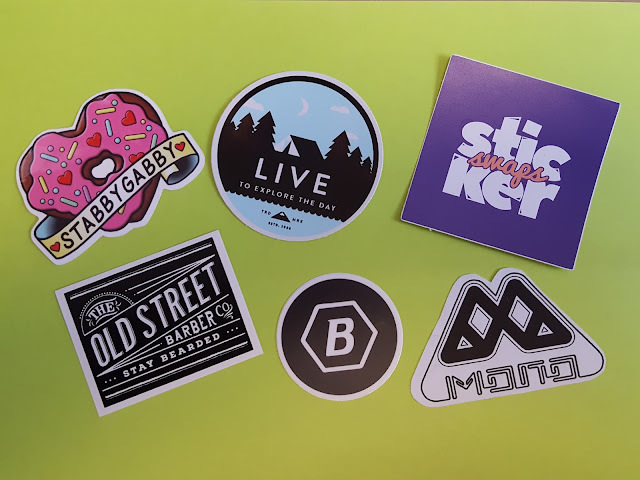 I haven't done enough research to find out the artists or brands behind all of them but I appreciate the time and effort that went into designing each and every one of these stickers. I'm a huge fan of anything with sprinkles so of course the Stabby Gabby sticker caught my eye first. A quick search reveals that she is a custom tattoo artist based in Minnesota. See? Exposure through stickers. It's a wonderful thing. And of course Sticker Swaps included their own branded sticker as well. Stick it on your mailbox and help get their name out which in turn will help out all of these featured artists! Verdict: The November pack contained 11 stickers and sells for US $9.99 on a month-to-month subscription plan. I think it's a bit steep but you have to take into account that this includes international shipping which can be pricey. You also have to consider that some stickers in here are unique and not very common. That said, this subscription will probably appeal most to sticker aficionados and those who are after the hard-to-find ones. If you'd like to try out Sticker Swaps, use code BLOG50 at checkout to get 50% off your first month (good with any subscription plan)! Or if you're a designer and would like your stickers to be featured in a future Sticker Swaps pack, drop them a line. Note: I received this sticker pack for free in exchange for my honest review. No referral links were used in this post.